September 22, 2016, 9:02 p.m.
By now it&apos;s old news that after announcing that the iPhone 7 wouldn&apos;t include a standard 3.5mm headphone jack, Apple&apos;s reputation took a hit. 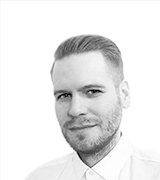 Late-night talk show hosts to people across Twitter derided the brand&apos;s decision to replace the universal smartphone feature with wireless earbuds called AirPods, which cost consumers an additional $159. 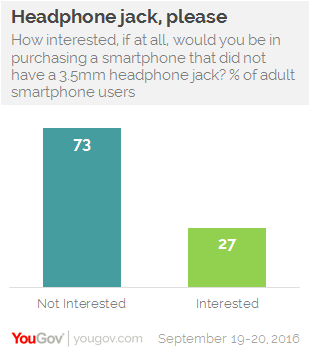 A new survey from YouGov confirms the negative response: 73% of adult smartphone users say they&apos;re not interested in purchasing a phone that doesn&apos;t come equipped with a 3.5mm headphone jack. 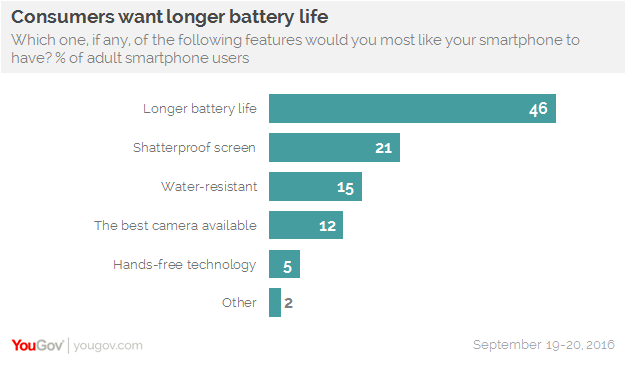 What smartphone users do want, on the other hand, is a device that doesn&apos;t require constant recharging. When asked to name the single feature that most appeals to them, 46% of users said longer battery life. In a distant second place, with 21% of the vote, came shatterproof screens, followed by resistance to water (15%) and a quality camera (12%). A closer look at the demographics reveals that women are slightly more in favor of possessing a quality camera than men, and peope aged 55+ are a bit more keen on hands-free technology than their younger peers. Millennials aged 18-34, who tend to hold their phone in their hand throughout the day more often than their elders, are the most likely age group to want water-resistant capabilities and a shatterproof screen.